Melding music and game play is an interesting area of game development which games such as Crypt of the NecroDancer, Beat Buddy, and Guitar Hero, have explored. Whilst exploring my own shamefully large collection of untouched games on Humble Bundle I happened upon the game 140 which makes its own contribution to this area. With lead designer Jeppe Carlson, (co-designer of the well know title Limbo) 140 was created by Carlson Games. Paraphrasing Jeppe, he describes 140 as an old school platformer, where the challenge is in syncing up your moves, and jumps to the music controlled elements. After a short time with 140 I thought to briefly note my impressions of the game. Disclaimer – This is not a thorough review, but notes of an impression based on approximately 20 minutes of game play. Everyone is fallible. On launching 140, the first thing that hit me was its minimalist art style. 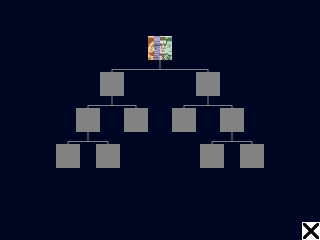 Its distinctive color scheme made it easy to identify puzzle patterns, and game elements. In 140, music is at the heart of its game-play with appropriately pulsating background, and game elements used with rhythm based mechanics to make interesting puzzles. 140 relies on players exploration of controls as I noticed no traditional tutorial which can be fine. Although some helpful information based on monitoring of the game state is good e.g explain to jump or move if a player hasn’t moved for a long time. Like other titles in this area 140 suffers slightly from issues of repetitive music. This issue I believe essentially stems from player progression which is something hard to control. I felt this game handled this issue well by splitting music into short levels. The difficulty of the game quickly ramps up, likely making it less accessible to the casual gamer. 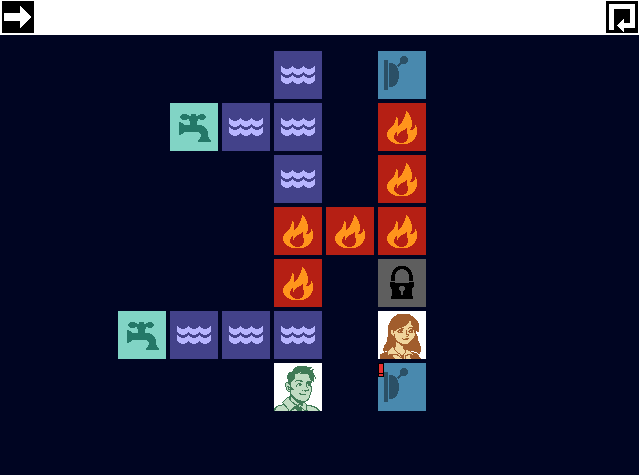 On the other hand though, this meant 140 presented more challenging puzzles, which is delight for some. It’s good that the creators of 140 realized the game difficulty, and employed frequent checkpoints through out the game. 140 bravely deviates off a more traditional pattern of game mastery by transitioning to a hail shooter from a rhythm based platformer at the first boss fight. I found the hail shooter boss encounter to be a disproportionately high increase in difficulty from the challenges before. The encounter left me frustrated (maybe I just sucked bad). Perhaps an easier encounter, or a series of checkpoints through the boss encounter would have been preferable. Raph Koster said ‘noise is patterns we don’t understand’, and so it felt appropriate that the ‘death blocks’ were static noise. 140s creators took this concept even further during the first boss fight as static noise breaks down into music. Like other titles in this area of game development, 140 suffers from issues of repetitive music. This issue I believe essentially stems from player progression which is something hard to control. 140 tackled this issue well by shortening levels, and splitting up music into those levels. I liked how the levels key (item objective) was innately tied to the next level through music. When hearing the keys music was excited thinking about how it would later manifest itself as a mechanic. All in all I enjoyed 140, being a nicely designed little gem it was a happy little surprise. Budding game designers should definitely give it a play as its a game well focused on how to meld music, and game-play. Thrillseeker is a game jam submission on the theme “You Are Your Own Worst Enemy” designed and created by my friend Sangseo Lee and I. The core mechanic of the game is that whilst flying close to passing asteroids gives you a higher score, doing so greatly increases your chance of crashing. It’s like Burnout in that the player is rewarded for high risk game play. To play it, download this zip file and run the executable inside (it’s a GameMaker exe file)! White blood cells play a vital role for our health, without them we’d be easy pickings to the likes of even the common cold. Play a moment in the life of a white blood cell and battle against an ever growing hordes of viruses and protect the red blood cells to keep your heart beating. Even better, do it with a friend! Happy hunting! 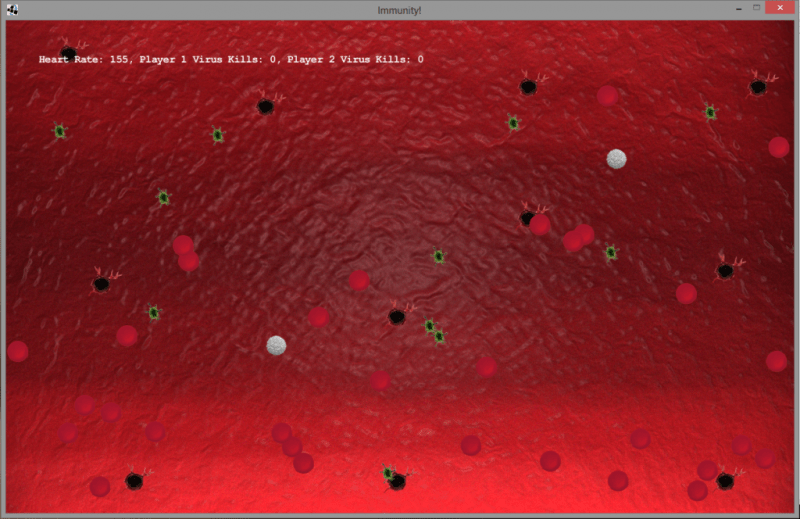 Immunity is a coop game that I worked on with Sangseo Lee, for the Global Game Jam 2013 at Edinburgh. It took second place in the local competition and was noted by the judges for best design. At the moment it’s written in Java using the Slick framework and can run on Windows, Linux, Mac and Solaris. Check it out at the Global Game Jam website here!